Welcome to another Three on Thursday list. Today I’m thinking about knitting hats. What with the 52 Hats challenge, it seems like I’m always thinking about hats these days. Recently I've added three more hats to my Ravelry queue. 1. Oak Leaf Beanie designed by Morgan Capestrain. 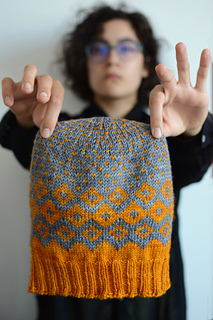 It's knit with Wool of the Andes and a twisted stitch chevron pattern. I love the idea of knitting something with the look of cables, but without the hassle of doing cables. 2. Weather the Weather Hat designed by Megan Williams. I love the lightening stripe zigzags. I have a love/hate relationship with lightening. I love thunderstorms and watching the lightening streak across the sky. But over the years, I’ve come dangerously close to being struck by lightening multiple times so I’m a little paranoid about it. As a teen aged lifeguard, I was standing about six feet away from the edge of the pool when it was struck. I’ve been on a sailboat and had the mast get struck. More than once, I’ve been in the water, swimming a boat back to shore that’s lost its steerage, when lightening was striking the water all around me. And several times, lightening has struck the ground just outside the window I was sitting next to. I’m a lightening magnet! 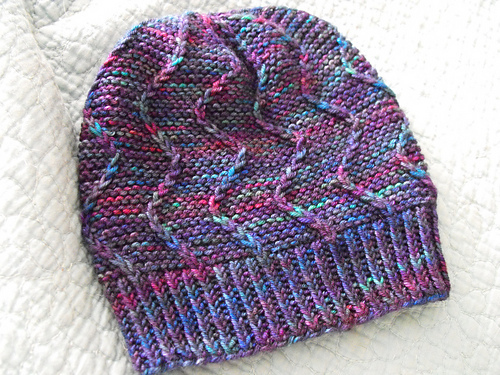 So I thought it would be fun to laugh in lightening’s face and knit a hat with lightening bolts on it. 3. Ferry in the Harbor designed by Kirsten Kapur. Besides wanting to get more practice with fair isle, or color stranded knitting in general, the hat’s named Ferry in the Harbor. If you couldn’t tell from my lightening story, I love anything to do with boats and/or water. Join me over at Carole's to see others' Three on Thursday lists. I love all the hats, but especially the Ferry in the Harbor! I might have yarn that will work in that one! I am all about knitting hats this year! Somehow I missed Ferry in the Harbor. I try to follow K. Kapur, but I missed this pattern somehow. It's going on my queue! Her patterns are great, right? All wonderful patterns. My Husband has a relationship with lightening too. He's been struck indirectly twice and directly once. He had shrapnel in his arm from being shot, accidentally by his brother! And then his rental car was shot up right after he got out of it, hitting the drivers side door! He leads a charmed life! 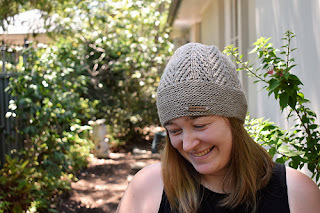 The brim of the Oak Leaf beanie is so pretty!